HONEYHOLE 3BR. Beautiful, spacious, and best of all...NO BUNK BEDS! Sleeps 6. 3 Bedrooms. 1 Bathroom. Venice is the premiere spot for hunting and fishing in Louisiana’s Sportsman’s Paradise. Venice is well known for having the best fishing areas in the country both inshore and offshore. Venice has easy access to the Mississippi River and the surrounding marshlands. We have comfortable accommodations for you during your stay in Venice Louisiana. Perfect for a family or small group. Located directly in the Venice Marina. The Honeyhole is in walking distance to the marina bar and restaurant. The marina also has a bait store, fuel dock, and parking lot for boats and trailers. The marina is full service and sells live bait, tackle, marine supplies, and it offers fish cleaning, vacuum sealing, and shipping of your fish. Dozens of professional fishing guides are located in the marina and can take you and your guests offshore or inshore fishing. Spacious 3-bedroom houseboat for rent. Approximately 1200 square foot inside. Full kitchen with stainless appliances including range, oven, dishwasher, side-by-side refrigerator, and microwave. Plenty of counter and cabinet space. Stocked with dishes, pots/pans, everything you will need for your stay so that you can cook your own meals. Also has coffee maker and toaster. Large living room with sofa and a loveseat with built in recliners. One bedroom has queen bed. Second bedroom has two twin beds. Third bedroom is a large loft with 3 twin beds. Loft also has loveseat with built in recliners. Best of all --- No bunk beds!!! One bath with full size shower. Towels and hairdryer provided. Nice back deck with fish cleaning station, stainless gas grill and 400 pound ice machine. No smoking allowed inside houseboat. No pets allowed. Please note that there isn't a washer or dryer available for tenant use inside the houseboat. However, in the marina there are coin-op washer/dryer available. Caution Notice: Please note that due to tidal ranges the houseboat could be 1 foot or more above or 2 feet or more below the level of the dock. 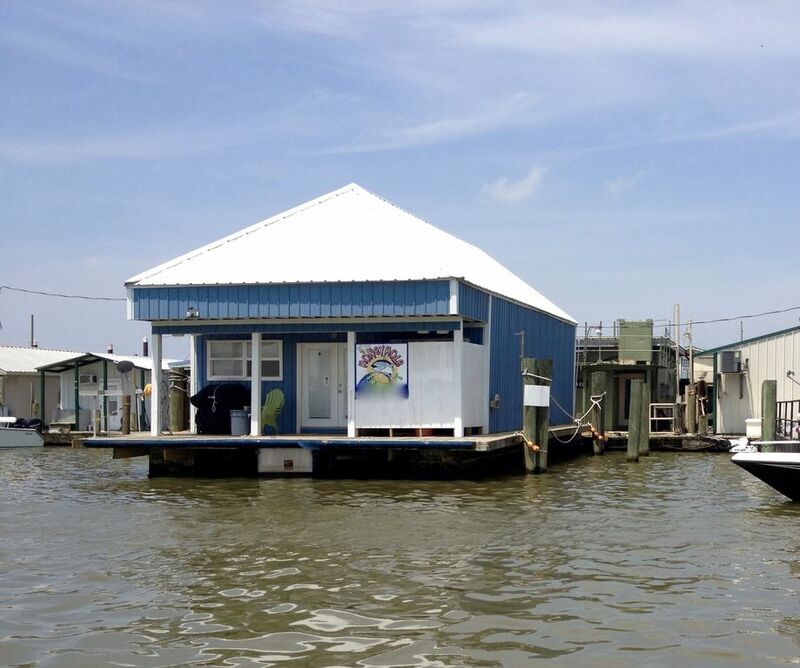 This houseboat is not suitable for those who are unable to step up or down as needed to enter the houseboat. There are no elevators, stairs, or ramps to provide access to the houseboat. Reservation/Damage Deposit: $300 Reservation Deposit becomes the Damage Deposit. The deposit will be applied to outstanding charges including, but not limited to, any damage to the HOUSEBOAT or its contents; Any lost, or damaged items and additional cleaning fees for excessive cleanup. The deposit will be refunded within 10 days of departure after HOUSEBOAT is inventoried, inspected, and found to be clean and undamaged upon checkout. The acceptance of the Security Deposit is not a waiver of Honeyhole’s right to charge for damages or fees in excess of the Security Deposit. Cancellation: Any cancellation must be in writing. Cancellations are only allowed prior to 14 days of the rental period. Cancellations within 14 days of rental period are only allowed in the event of mandatory evacuation. Should the reservation be cancelled within the 14 days of the rental period then the entire rental fee is forfeited and the reservation/damage deposit will be returned. No refunds will be given for inclement weather, illness, accident, change in plans, personal emergencies, or otherwise if not done in writing 14 days prior to arrival date. Policies: No smoking allowed inside HOUSEBOAT. Customer agrees to abide by all Houseboat policies. I bought this property to eventually have during retirement, but sharing it until then is the plan. There is no better fishing and hunting in the world! Wildlife is plentiful and if you need a place to relax and forget about time and your troubles for a while, this is the place! Full size shower. Towels and hair dryer provided. Large parking lot can accommodate trucks and boat trailers. Sofa, loveseat and color TV. Dishes, pots, pans, and utensils provided. Full size kitchen with plenty of cabinet and counter space. Wood dining set includes table with four chairs and a bench that seats two. Total dining seating is for 6 people. Dish satellite TV. Please note that satellite TV may not work during storms. Back deck overlooking marina. Fish cleaning station on back deck. Also has a 400 pound ice machine. We love staying at the Honeyhole! This was our second time and it was just perfect for our family’s fishing trip. The kitchen is better equipped than any rental we’ve ever stayed in—no need to bring anything from home. We love being right on the water! Super clean and plenty of room! Nice place. Clean. Very convenient for charters to pick you up. HONEYHOLE is a nice spot to stay. It is super convenient to have your charter able to pick you up and drop you off on the back porch. The back porch is where we spent most of our time when we were at the houseboat. The neighboring houseboats were not too close. Everything at HoneyHole was neat, clean and organized. The guest book was helpful and even had a few favorite recipes if you were cooking your catch. Check in and checkout were very well explained and easy. The only thing to be aware of, and the owners tell you this, is getting on and off of the houseboat. The barge part that the house sits on sits up about two feet, maybe a little more. If your mobility isn't very good you may have a tough time. If you can climb in and out of a boat, you should be fine. We would definitely stay here again. Very positive experience! Lovely accommodations. Spacious, clean, great furnishings. Great location from the marina! !